Product recommendation is an old age marketing companion that has proven to uplift conversion rates by up to 915%. However, more sophisticated marketers and sellers all over the world have not stopped by just recommending products. Today, online retailers have adopted to recommend products into more personal data-driven recommendations to offer the most relevant products that customers are interested in buying. And with these personalized data-driven recommendations, online stores have seen their sales to leap by up to 75%. But, with the vastness of data, ensuring that you’re capturing all the key information and using them to your advantage can be a tough challenge. The complexity of product recommendations and making sure that they are tailored-fit with every customer’s visit can be a handful to some sellers. So how do you deepen your knowledge and insights with your customers to create a personalized engagement that will drive conversion and revenue? How can you extend your product recommendation efforts across every customer touchpoint on all channels? 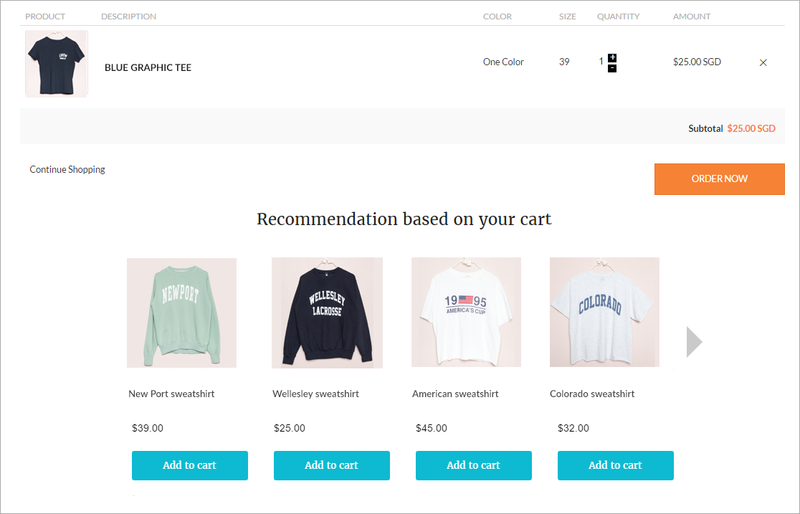 This article explores how personalized product recommendations, anchored with the right techniques and execution, can successfully draw more transactions and drastically expand more revenue to your eCommerce store. Running an online shop? You might not want to miss out on this free-to-get Personalized Recommendation tool to set up product recommendation sliders on your website pages. Available for Shopify, WooCommerce, BigCommerce, Weebly, SEOshop, and Magento. 70% of Amazon’s homepage is dedicated solely to product recommendations. If you are a first time visitor, you will see recommendations based on the other shoppers’ browsing and buying patterns. And then, if you visit again and sign in to their site, you will find personalized recommendations on the homepage catered on your browsing habits from the past. For signed-in customers, Amazon employs a dedicated slot on its homepage to recommend products personally curated for the shopper. It also lists all the shopper’s recently viewed items. Unlocking the full potential of your homepage through the incorporation of personalized product recommendations have seen an increased conversion rate by 248%. The overall online store sales have also grown by 0.5 percent from personalized product recommendations on the homepage alone. Focus on what matters, use heatmap tool to see exactly what people do when they visit your homepage: Within your homepage, track the clicks, mouse movements and scrolls to create a heatmap of where your visitors fixate their attention most of the time. This helps you catch where the most interactions are, so you can strategically place your recommendations. Few tweaks might do the trick, try A/B testing homepage recommendations strategy: Split testing or A/B testing is a method of comparing two versions of your homepage to determine which one is performing better. It also helps you understand as to whether small changes might improve the effectiveness of your homepage activity. Should you show your on-sale items on your homepage? Do first-time visitors more likely to convert if your show products that are ultimately purchased together? Does changing the position of call-to-actions drastically increase your sales? A/B testing helps you answer these questions. Category page recommendations create algorithms to precisely offering product categories that are most suited to shoppers based on their previous browsing sessions or product purchases. Many online retailers fail to recognize that optimizing their product category pages can improve their site sales with an additional 1.3% revenue. For example, if a visitor previously browsed for handbags, you can recommend a category of your top-selling handbags for the month when she visits your shop again. Top Rated Items: Northern Tool, for example, shows a product category recommendation of Top Rated portable generators to entice previous visitors who searched for the same item. Guide New Visitors: Product category recommendations do not only work for previous shoppers, for those visitors whom you don’t have any data yet, you can recommend your best-selling items or your top promotions like sales or new arrivals. Bass Pro recommends to new visitors a product category of their new arrivals, clearance sales and special buys of the week. The most obvious way to put your personalized product recommendations is on the product page itself. Designing the most effective and appropriate way to showcase your items is a crucial part, as it could either drive your shoppers to proceed to checkout or drive them away from your online store. As your customers navigate deeper into your product pages, you can unlock their real interests by collecting how they browse and search. Then subsequently remodel your product recommendations to dynamically adapt to the products that they are looking at. Data-driven recommendations offer shoppers more options on this very critical browsing stage. By putting more product selections based on their interests, conversions will increase by 411%. Improving your recommendations on your product page will also give you more revenue by 6.5%. Recommend supplementary or complementary Items: Showcasing coordinating or supplementary items is a cross-selling technique that can be incorporated on your product page. Say, for example, a shopper is looking at a towel, you can cross-sell a coordinating item such as a towel rack. Overstock showcases “Coordinating Items” such as bed sheets and pillows whenever a shopper looks at a bed. An online store’s shopping cart is probably the last step to successful conversion as it is where customer payment and shipping information happen. And so, some online merchants create a one-step checkout process to push a faster conversion. That’s why they avoid adding anything else that will prevent or distract consumers’ purchase. This, however, poses a problem as avoiding to add marketing strategies such as product recommendations in the shopping cart will also prevent you to maximize more sales opportunities. In fact, shopping cart product recommendations will even drive shoppers 9 times more likely to convert. So, if you avoid adding recommendations to your shopping cart, you’re also staying away from better conversions. To maximize your shopping cart conversions, try to inject upselling and cross-selling techniques. Your shopping cart is a great touchpoint to upsell and cross-sell more products based on the shopper’s browsing activity and purchase history to help you add more sales by 1.5%. Ensuring product relevance on your landing page once a customer searches for a particular product boosts conversions by 192%. Personalized search landing page means that you will design a customized landing page based on the customer-specified search terms. 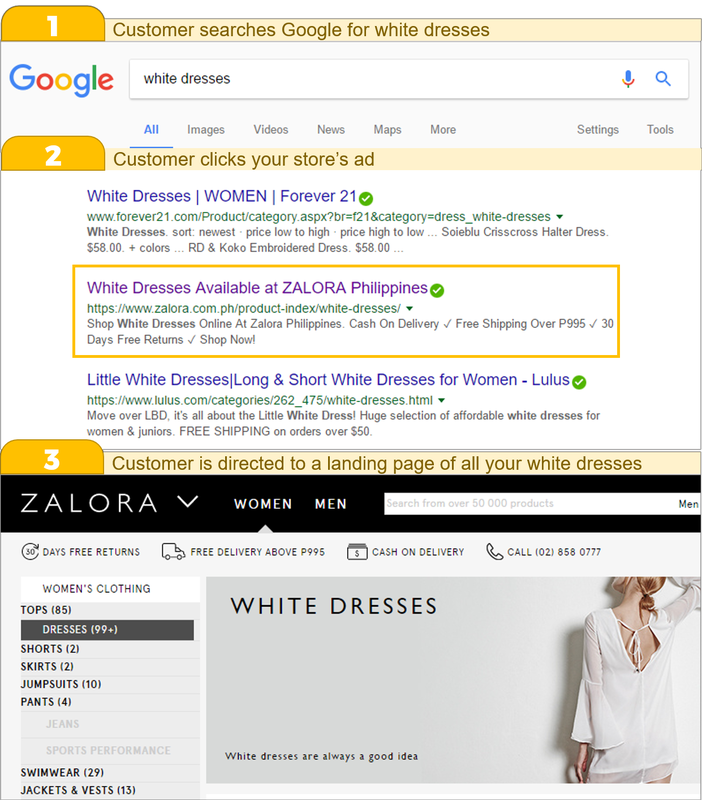 For example, if your customer googled for white dresses and clicked on your store, make sure to that your landing page will just offer all your available white dresses. It’s a poor impression if a shopper is looking for a pair of red shoes but when he clicks your site, it lands him on red bags or other unrelated items. If this happens, you are losing your credibility as a perfect merchant for him, and so he will leave your site. 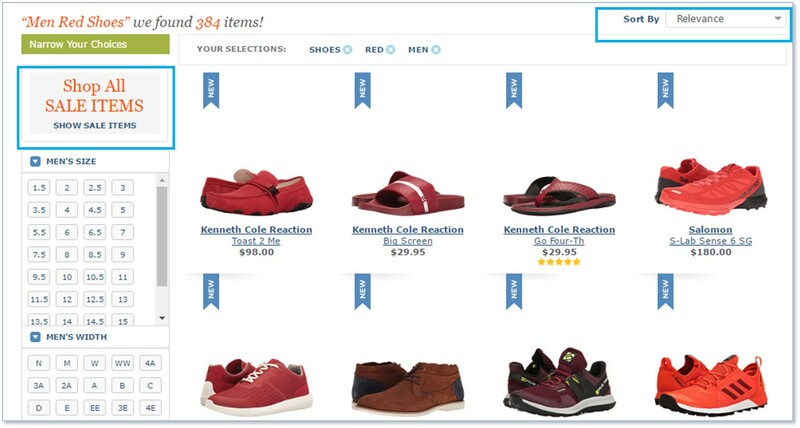 Take for example how Zappos delivers a personalized landing page of men’s red shoes when a shopper googles for the exact product type. It also allows the shopper to sort the items by relevance and show him the related items that are on sale. Comparable to the search landing page recommendations that we have discussed above, on-site search results can potentially be a good avenue to recommend products. If a shopper is on-site searching for a particular product, ensure that your on-site search results page will recommend the right product based on the search terms that the shopper entered. If you put the relevant items and subsequently recommend more similar products, your store will have an extra 2.3% sales. Sometimes, there could be instances when a user searches for a product but the dreaded “No Results Found” will show up. It can’t be avoided, but there’s a way to address this gap. You can use product recommendations that will upsell or cross-sell the closest item based on the search term. For example, Lazada features top sellers with closest keywords in replacement of zero search returns for specific items. 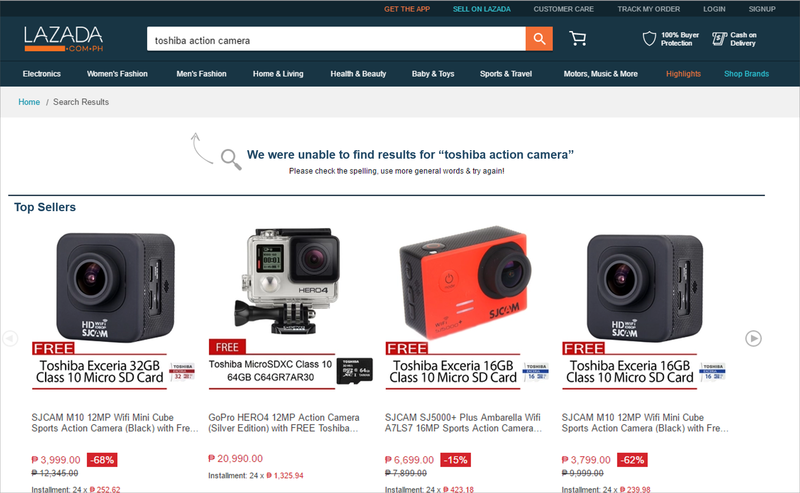 The above example shows that Toshiba has no action cameras but has microSD cards for action cams, so Lazada offers all action cams with free Toshiba microSD cards. We have seen email marketing to surpass the test of time when it comes to its marketing strategy effectiveness. Time and time again, email marketing has been an amazingly cost-effective companion to increase sales with revenue investment conversions as high as 4300%. But, traditional email marketing has been updated to a more customized engagement. With many customers wanting to receive highly relevant messages with their preferred product interests, personalized email recommendation is now the trend. The more shoppers receiving relevant email contents, the higher the email opens, website visits, and more importantly an increase in potential purchases. Browse abandonment emails: There are shoppers who spent a considerable amount of time that have shown interest in particular products but have not added anything on their cart and eventually just left your store. This scenario is called browse abandonment. And when this happens, it is crucial that you capture these visitors and send a browse abandonment email designed to remind them about the items that they have viewed on your site. Within your email, don’t forget to recommend similar or complementary items to maximize your strategy. ● Cart abandonment emails: When visitors place a product in their shopping cart but leave your site without pushing through with the purchase is called cart abandonment. If this happens, it is important to build your own cart abandonment email that will trigger a reminder that they have left items in their cart. Subsequently, within your cart abandonment email, cross-sell and upsell similar or relevant items that they may like. Your shopper has successfully purchased an item, congratulations! But do you just end there? Or are you those brilliant sellers who maximize the opportunity by recommending more? If shoppers purchased something, you don’t want to stop their buying session. Your order confirmation which basically shows the items that they bought can still be a good avenue to suggest products that they may be interested to buy. The order confirmation page can potentially add more sales by at least .3%. So, take this last chance to pitch more in order to earn more. Order confirmation recommendation popups: Thank your customers with their recent purchase, show them the confirmation of their order and include messages such as “You might be interested in this product”. If you send order confirmation emails, upsell and cross-sell recommended items: If your online store employees an automatic order confirmation email, it is a good idea to put recommended products within your email body. To stir more interest and persuasion, this is a good way to include discounts or freebies redeemable on their next purchase. Your customers and visitors always leave a rich track of information as they browse and buy through your online store. With that wealth of information at your fingertips, e-commerce businesses can drive that abundant data into work to recommend products in order to increase the customer’s order value. Thus, as order value goes up, revenue also heightens. Our product recommendations strategies have been engineered to help you showcase real-time and intelligent offers relevant to every customer on every step of their shopping experience to maximize every moment which seizes more sales. Thanks for sharing your tips, Daisy! This is very true, if we indeed maximize every moment, we seize more sales. I’m excited to share this with our team. Great post! Thanks for interested in our post. We deliver fresh content regularly. Keep updated!